UN chief Kofi Annan has ended a trip to Iran with little apparent progress over its controversial nuclear programme. Mr Annan said Iran was prepared to discuss its uranium enrichment programme, but would not suspend the work before negotiations. He also said that Iran had reaffirmed its commitment to support the UN resolution on Lebanon, following talks with President Mahmoud Ahmadinejad. He did not meet Supreme Leader Ali Khamenei, which the UN had expected. The secretary general also touched on the issue of the Holocaust, saying it was a fact that should be accepted. Iran's president earlier called the Holocaust a "myth". Mr Annan arrived in Tehran on Saturday for talks with Mr Ahmadinejad, Ayatollah Khamenei and other key leaders. On the nuclear issue, Mr Annan said the president "reaffirmed to me Iran's preparedness and commitment to hold negotiations" on the issue and wanted a negotiated settlement. EU foreign policy chief Javier Solana is to meet Iran's chief nuclear negotiator Ali Larijani next week for key talks. 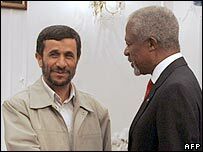 But Mr Annan said Mr Ahmadinejad had stressed there would be no suspension of uranium enrichment - as demanded in a UN resolution - before negotiations. Iran insists its nuclear programme is solely for civilian nuclear power generation, while Western powers fear a weapons programme. Iran failed to heed the 31 August UN deadline to stop enrichment and on Friday the US said it was consulting European governments about the imposition of punitive sanctions against Iran. 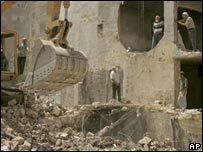 On Lebanon, Mr Annan said the president had assured him Iran would back UN resolution 1701, the basis of the ceasefire which ended the recent 34-day conflict between Israel and the Lebanese militant group Hezbollah. Iran is a key backer of Hezbollah, and is widely suspected to have supplied arms used against Israel. Mr Annan told reporters the president had agreed to "do everything to strengthen the territorial integrity of Lebanon, the independence of Lebanon and work together for the reconstruction of Lebanon". Mr Annan said Iran was an important regional player and the president had assured him it would play that role. The issue of the Holocaust also surfaced during Mr Annan's visit. Iran said it would go ahead with sponsoring a conference on the scientific evidence of the Holocaust, calling it exaggerated. Mr Annan linked the issue to that of cartoons of the Prophet Mohammed, which incensed the Muslim world. He said the cartoons had shown freedom of expression had to be "exercised with responsibility, with sensitivity and judgement". There is currently an exhibition in Tehran of cartoons on the Holocaust. Mr Annan added: "I think the tragedy of the Holocaust is a sad and undeniable historical fact and so we should really handle that. "We have to be careful, words can soothe and words can harm, and we should be careful not to say anything that is used as an excuse for incitement to hatred or violence".